Sleep apnea is a common condition with symptoms that include sleep loss, loud snoring, bad headaches, and exhaustion throughout the day. If you or someone you’re with suffer from loud snoring or sleep apnea, Dr. Marvizi and Dr. Rayhan here in Los Angeles can give you the relief you need with a custom fit Oral Appliance. Custom oral appliances for the treatment of sleep apnea have become more and more popular as a growing awareness among the public that oral appliances are an effective first line treatment for many sleep apnea sufferers. These appliances are worn while you sleep, just like a sports mouth guard or an orthodontic appliance. Oral appliances hold the lower jaw forward just enough to keep the airway open and prevent the tongue and muscles in the upper airway from collapsing and blocking the airway. 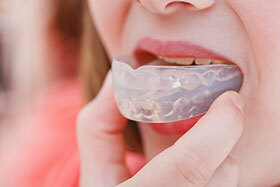 The American Academy of Sleep Medicine (AASM) has approved custom oral appliance therapy (OAT) as a first line treatment for patients diagnosed with mild to moderate Obstructive Sleep Apnea (OSA). The AASM also recommends custom oral appliances for patients with severe OSA, who are unable to tolerate CPAP devices. The single most common cause of sleep apnea is a narrowing of your airway as you sleep, which limits the supply of oxygen to your brain. While asleep, the muscles that control the tongue start to relax which makes the tongue fall into the back of the throat, creating a blockage that affects your breathing. Watch the video to see what we’re talking about and how a custom oral appliance can help. Here in Los Angeles, Dr. Marvizi & Dr. Rayhan have helped hundreds of people who have suffered from sleep apnea and snoring and can help you as well. Fitting you with custom oral appliance will ensure that your jaw and tongue stay in their proper alignment, preventing the restriction of breathing and giving you the ability to sleep soundly through the night. You wear the device all night long, and don’t worry — after the first night or two, you’ll hardly even notice it’s there. Don’t put it off and give us a call today at 323.931.3881 to get the relief you need! View, print, and fill out our Sleep Health Questionnaire to bring with you to your complimentary consultation.